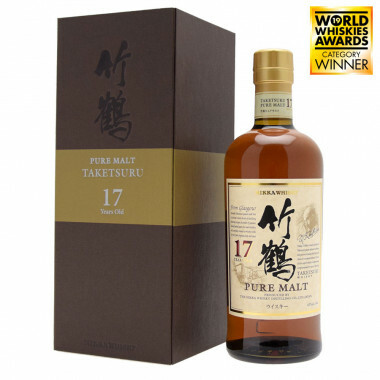 Taketsuru 17 Years Old has been voted best blended malt in the world several times. It is a vibrant homage to the founder of the Yoichi distillery, Masataka Taketsuru. This malt is a wonderful combination of creamy, fruity and chocolatey note. The 17-year-old Taketsuru Whiskey has been repeatedly voted Best Blended Malt in the World. In March 2019, it won the Best Whisky Award in the category of 13 to 20 year old whisky at the World Whiskies Awards. It is a vibrant homage to the founder of the Yoichi distillery, Masataka Taketsuru. This malt is a wonderful combination of creamy, fruity and chocolatey notes and may altogether be enjoyed neat, on ice or with a drop of water to open up the whisky and reveal all of its aromas. It has been crafted from Yoichi and Miyagikyo Single Malts aged in Sherry casks. Colour: old gold with glints of copper. Nose: spicy and delicate, it also develops notes of fruit (yellow mirabelle plums, peach skin) and chocolate. It lingers with aromas of old leather, dried tobacco leaves and dried fruit (apricots, figs). Palate: voluptuous and generous, it presents candied fruit (orange zest), fruit in brandy (Morello cherries) and a delightful smoothness. Creamy, it develops notes of toffee, mocha and toasted nuts (hazelnuts). Finish: long and worthy of an old Speyside whisky, it is characterised by praline, burnt wood and cigar smoke. Aniseed flowers and citrus fruit bring freshness. There are also some delicate herbaceous notes (dried grass). Best Japanese Whisky, 13 to 20 year old whisky category, World Whiskies Awards 2019. Worlds's Best Blended Malt at the 2012 and 2014 World Whiskies Awards.